Charles Lightoller , St Margeret’s, Isleworth, Whitton, Kneller Gardens to Twickenham for lunch at the ‘Prince Blucher’, Strawberry Hill, Teddington, Hampton Wick & Kingston Bridge. Sub Total 12 Miles, 1 new face, thanks to John E for back marking & many others for watching corners. Sunday 23rd September, Part 1. A very wet grey Morning saw just 2 brave or perhaps idiotic Cyclists, take the courageous decision to go for an extended Coffee break, as they locked the Bikes a 3rd Cyclist, belatedly arrived, (from South of the Borough), but the decision had been made, with the Skies lightening somewhat after an Hour, still with light Drizzle, the 3 set off via Cranes park, Berrylands, to New Malden for a very good lunch at Woodies, returning via Norbiton & Bonner Hill to Kingston. Sub total 6 Miles. Wednesday 13th June, a Bright start, with increasing Clouds, saw 14 Cyclists, leave via Lower Marsh, Berrylands, New Malden, Coombe, Ladderstile gate of Richmond Park, White lodge, to Richmond gate to Richmond Hill for refreshments at the ‘Roebuck’, with a cooler finish to the Evening, due to the total Cloud cover, return via Richmond Park, to Kingston Gate, to the Market place, with a fruitless search for a ‘lost Cycle helmet’. Sunday 3rd June.A mostly warm, Sunny day saw 24 Cyclists leave via Lower Marsh, Berrylands, Tolworth & Greenway, West Ewell, Epsom, Epsom downs, Burgh Heath, Banstead, to Woodmansterne for lunch at the ‘Woodman’, -very good apart from a minor hiccup with our Leaders lunch, ;-( -then Clockhouse, Woodcote Garden village, South Beddington, to Beddington Park for Tea & BP at a very busy ‘Pavilion Cafe’, Hackbridge, Wrythe Green, Benhilton, Pyl Brook path, Sir Joseph Hood Park, Motspur park, New Malden, Berrylands, the Grove to Kingston. Total 29 Miles, thanks to Will & Steve D for Back marking and many others for marking corners, thanks to John for the Bread pudding. Sunday 27th May. A mostly warm Sunny day, without any of the predicted ‘thunder Showers’, (thankfully), saw 23 Cyclists leave via the Portsmouth Rd track, Giggs hill Green, Weston Green, Esher, Walton on Thames, Ashley Park, Walton Bridge, Shepperton, Chertsey Bridge, Chertsey, Thorpe Village, to Thorpe Green for lunch at a very hospitable ‘Rose & Crown’, then Stroude Cycle path, Egham Hythe, Staines Bridge, Staines Riverside, Thames Towpath, Laleham, Shepperton, Haliford, to Sunbury & the ‘Walled Garden’, for Tea & BP, Lower Sunbury, Hampton, Bushy Park, Hampton Wick, Kingston Bridge. Total 32 Miles, 2 new Faces, thanks to Will & Mike for Back marking duties, & others for watching corners, special thanks to John for the Bread pudding. Wednesday 23rd May, a mostly bright evening saw a Bakers dozen, (13 Cyclists), leave via Lower Marsh, Berrylands, Southborough, Long Ditton, Claygate, Esher to Esher green for refreshments at the ‘Wheatsheaf’, -with a very amusing Barman not happy that we weren’t on a Charity ride-, even threatening to take some drinks back, then Weston Green, Thames Ditton, Portsmouth Rd, (with the extension to the Cycle track, along the High St making steady progress. Total 13 Miles, 1 new face, thanks to Steve J for Back marking duties. Sunday 13th May. a Cloudy morning, with some Sun later, saw 15 Cyclists leave via Lower Marsh, Berrylands, Tolworth greenway, West Ewell, Hogsmill path with added ‘fun runners’, St. Ebba’s path, Manor Park, Woodcote, Headley, Pebblecombe- with many of the group having the chance to do some Train spotting at the Level crossing-, Betchworth, to Leigh for lunch at the ever reliable Plough,- to find that 1 extra person had missed the start, taken an alternative route via Epsom, and saved the best table for the greater party, thanks Steve-, then Flanchford, Reigate, Wray Common, Gatton Park, Gatton, Chipstead, to Banstead for Tea & BP at Pistachios, Belmont, Sutton, North Cheam, Motspur park, New Malden, Berrylands, to Kingston. Total 41 Miles, thanks again to John E for back marking, & many others for marking corners, thanks to John D, back from his travels, for the Bread Pudding. Wednesday 25th April. A bright evening after a few earlier showers, and after much debate, saw 5 Cyclists leave via Kingston Bridge, Bushy Park, Hampton Hill, Fulwell, River Crane path, Twickenham, with the first option now closed & covered in Scaffolding, to the Royal Oak for refreshments, then Twickenham, town, Strawberry Hill, Teddington, Hampton Wick, Kingston Bridge. Total 11 Miles. Thanks to John for Back marking. Sunday 22nd April. 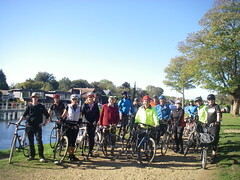 A bright Sunny morning, with increasing Cloud in the Afternoon, saw 20 Cyclists leave via Kingston Bridge, Hampton Wick, Teddington, Fulwell, River Crane path, Whitton, Hounslow heath, West Hounslow, Cranford, Harlington, Sipson to Harmonsworth – with the first choice Pub, the Five Bells having no food – The Crown more than filled the gap with very generous portions & very good service, then a short detour to visit the great Barn, (also known as the Cathedral of Middlesex), -with some of the group electing for an extra Tea stop-, then Harmondsworth Moor, Poyle, Stanwellmoor, Ashford,- including a new Cycle path along Town Lane-, Feltham, Hanworth, Hampton Hill to Bushy Park for Tea & BP at the ‘Pheasantry’, Hampton Wick & Kingston Bridge. Total 30 Miles, thanks to Bob for Back marking & Many others for marking corners, special thanks to Derek for the Bread pudding. 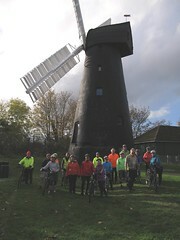 Sunday 8th April,a largely wet and grey day saw 20 Cyclists leave via Fairfield, Bonner Hill, Norbiton, New Malden, Malden Golf course, Copse Hill, Wimbledon village, Wimbledon Park, Earlsfield, – with a slipped Chain & A visit from the ‘P fairy’-, Wandsworth Common, Clapham Common, Larkhall, Oval, Kennington, Burgess Park, Surrey Canal Path to Peckham, for lunch at the ‘Kentish Drovers, then Camberwell, Dulwich, Brockwell Park, Tulse Hill, – with 1 of our party almost wiping the leader out-, ‘Streatham Hill, to Tooting Bec Common for Tea & BP, then Furzedown, Mitcham, Colliers Wood, Merton park, Cannon Hill, West Barnes Motspur Park, New Malden, Berrylands, to Kingston. Total 33 Miles, 4 new faces, thanks to Steve D for Back marking, & others for marking corners, thanks to Derek for the Bread pudding. Sunday 18th March. Part 1, with 3 Cyclist’s having missed the information that part 1 had been cancelled, due to the freezing temperature, thanks to Derek for leading an impromptu ride around a somewhat Muddy Bushy Park, then Surbiton for lunch at ‘Wags & Tails’, then back to Kingston. Part 2, farewell to 1 & welcoming 4 fresh, brave faces, with the Temperature just above 0deg C, so 6 Cyclists left via Kingston Bridge, Thames Towpath to Hampton Court, East Molesey, Esher, a ‘slippery’ Littleworth Common, Claygate, to Long Ditton for Tea & BP at Squires Garden centre, Long Ditton, Surbiton to Kingston. Total 12 Miles, thanks to John E for Back marking, thanks to a ‘Peddestrian’ John D for the Bread pudding. Helpful hint: Anyone who suffers with Cold Toes or feet, try wrapping them in Tin foil, thanks to Ken for that. Sunday 4th March. A mostly cloudy day saw 16 Cyclists leave via Kingston Bridge,- with the tail end becoming briefly detached-, Bushy Park, Hampton, Fulwell, Crane River path, Whitton, Hounslow, Osterley, Osterley Park,- with a still largely Frozen Lake-, Norwood Green, Southall, Greenford, to Northolt for lunch at the Crown, (Sizzling Pubs), then Grand Union Canal Towpath, Horsenden Lane, Perivale, Pitshanger Park, Brentham, Hanger Hill, West Acton, Acton Park for Tea & BP, South Acton, Chiswick Park, Chiswick Green, Grove park, Chiswick Bridge, Mortlake, East Sheen, Sheen gate Richmond Park, Kingston gate to Kingston. Total 31 Miles, 1 new face, thanks to John D for the Bread Pudding, thanks to John E for Back marking, & many others for marking corners. Sunday 18th February. A largely bright day saw 24 Cyclists leave via Portsmouth Rd track, Long Ditton, Hinchley Wood, Esher, Fairmile, Cobham, Downside, Bookham Common, (including the ‘Isle of Wight Pond’), Fetcham, Leatherhead, to Ashtead for lunch at a very hospitable ‘Woodman’, (Ember Inns), then Ashtead Park, Epsom, ‘the Nescot Path’, East Ewell, Nonsuch Park, Cheam, Worcester Park, to Lower Morden & the ‘Wyevale Garden centre’ for Tea & BP, Motspur Park,- where a broken down ‘Southwestern Railway’ train decided to play a little subterfuge on our leader & 1 other Cyclist, who elected to use the the rickety old Footbridge, only for the train to move off, & the Barriers raised, -, New Malden, Berrylands, to Kingston. Total 33 Miles, 1 new face, thanks again to John E for back marking & many others for marking corners, thanks to John D for the Bread Pudding. 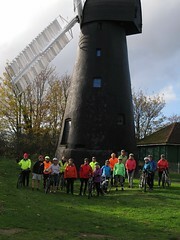 Sunday 4th February, a cold, overcast, but dry day saw 15 Cyclists remember the early start, from New Malden, via Shannons corner, Cannon Hill, Morden Park, Morden, Ravensbury Park, (& the Wandle Rangers hard at work), Mitcham, Mitcham Common, Pollards hill, Thornton heath, Selhurst, South Norwood Country Park, Elmers end, Cator Park, Beckenham, Plaistow, Bickley, Jubilee Country Park, to Petts wood for lunch at ‘the Sovereign of the Sea’, (Wetherspoons), then Southborough, Norman Park, Hayes, West Wickham, Shirley, Croham, South Croydon, to Waddon for Tea & BP at the Wyevale Garden centre, (and its grade ll listed Diving board ! ), Bandon hill, Beddington Park, the Wrythe, Benhilton, North Cheam, Joseph Hood memorial Park, Motspur Park to New Malden. Total 41 Miles, 1 new face, thanks to Will & John E for sharing Back marking duties, and many others for marking Corners, thanks to John D for the Bread pudding. Sunday 21st January. A cold, at times Freezing cold wet day, with occasional flurries of Sleet, saw 8 brave Cyclists, with 1 extra just joining the tail, leave via Skerne Rd, Latchmere, Ham, Ham gate Richmond Park, White lodge, with a pause for a Herd of Stag’s to cross, after being chased by a dog, Roehampton Gate, Barnes, Hammersmith Bridge, Fulham, West & North Kensington, then the Grand union Canal Towpath, to Harlesden for lunch at ‘the Grand Junction arms’, with ‘slightly’ warmer temperature, back on the Towpath, to Park Royal, West Acton, Ealing Common, South Ealing, Brentford to Syon Park for Tea & BP at the Garden Centre, after a belated presentation to the winner of ‘most rides in 2017’, to Jon White, Isleworth, St Margerets, Twickenham, Strawberry Hill, Teddington, Hampton Wick & Kingston Bridge. Total 29 Miles, thanks to John E (again) for Back marking, thanks to John D for the Bread pudding & Jon W for the Photo’s. Sunday 7th January. A bright but cold day saw 22 Cyclists ready for the first ride of 2018, leave via Lower Marsh, Berrylands, New Malden, Motspur Park, with an altercation between an ‘impatient Van Driver’, and John today’s back marker, causing a delay, with Police also stopping to take details, all back together, Cannons hill, Lower Morden, Merton park, South Wimbledon, Wandle path, Earlsfield, -with a strong Headwind,- Wandsworth Common, Clapham Common, to Battersea for lunch at ‘the Asparagus’, (Wetherspoons), then Thames Path, Wandsworth,- with a mass of Motorists enjoying the wait to get into the Refuse dump, – Wandsworth Park, Putney, Barnes Common, Roehampton, Roehampton Gate, Richmond Park,- with a Queue out the door of the Cafe, a strategic decision was made to try Pembroke Lodge, a slightly shorter wait, but still entailing Tea & BP ‘alfresco’, but fantastic, if slightly hazy views over West London, then to Kingston Gate, to return to the Market place. Total 27 Miles, 1 new face. Thanks once again to John E for back marking, & others for corner marking, also thanks to John D, (back from his travels), for the Bread pudding.